Well, it’s nice to see Claire Huxtable on my television again. Unfortunately I don’t think Do No Harm was the best vehicle for her to make her triumphant return to the small screen. This show is a mess. A better title would have been Do Not Watch. Do No Harm is basically Dr. Jekyll and Mr. Hyde with a little bit of United States of Tara thrown in. Steven Pasquale stars as Dr. Jason Cole, a nice guy and an accomplished neurosurgeon who is hiding a major secret: he has dissociative identity disorder (a real thing, but I am guessing that they take a lot of liberties in the show) and every night at 8:25 his alter ego Ian Price takes over for the next 12 hours. Ian is a violent psychopath who only cares about his own pleasure and who seemingly doesn’t like Jason very much and is hell-bent on destroying the good doctor’s life. Jason has tried to control Ian by taking medication that knocks him out every night when Ian would appear, but that is no longer working (because otherwise there wouldn’t be a show). Now that Ian is off his leash, he wants to ruin Jason’s career and his budding relationship with his colleague Lena Solis (Alana De La Garza), as well as find a woman from their past (Ruta Gedmintas) who both personalities loved. It doesn’t make any more sense on the screen; there is a lot going on in the pilot of Do No Harm and it is best if you don’t think about any of it for too long or you are down the rabbit hole of trying to make heads or tails of this whole thing. This is not a show that holds up to even a little scrutiny. In other words, I don’t think reality and the people behind Do No Harm have ever met. Almost every component of the premise has some real problems. Now I don’t necessarily need my television to always be grounded in reality, but when you spend more time thinking how ludicrous everything is rather than watching the show that is a real problem. For starters: It seems like a doctor, more than almost any other profession, would have an incredibly difficult time compartmentalizing his work into a 12 hour period. How exactly did he get through his residency with this condition? And should someone with an alter ego that enjoys hurting others really have gone into medicine, let alone neurosurgery, to begin with? How did someone make it this far in life and become this successful with this much baggage and by keeping so many people in the dark about it? Jason could avoid a lot of future problems with Dr. Solis if he simply said “So Lena, I really like you a lot. But there is something you should know. I have this thing……” Problem solved. I like Steven Pasquale – he was great as Sean Garrity on Rescue Me – and I certainly don’t begrudge him a leading role. I think he’s more than capable of carrying a show when the material he’s given isn’t so terrible. Pasquale’s performance was actually one of the few things that I thought generally worked in Do No Harm and I can definitely see why an actor would be attracted to the idea of playing two different personalities, as it provides a real challenge and the chance to stretch their wings. The transformation between the identities is done almost exclusively by Pasquale changing his physicality and his speech; there is no make-up involved or distinctive clothing options like on United States of Tara, so it falls to the actor to differentiate Jason from Ian. Pasquale does a good job of this, though when he is playing Ian the performance is a little hammy. However, I think his acting choices are kind of limited in how he can portray this character, so while it was a little over the top it wasn’t necessarily to the detriment of the performance. So where does Claire Huxtable (Phlylicia Rashad) come in to all of this? She is one of the many underdeveloped fringe characters that are trying to make this mess work. As the Chief of Medicine, her job is primarily to look the other way when one of her doctors starts acting erratically. Samm Levine (Freaks and Geeks) has even a smaller role as Jason’s assistant. I’m not really sure what Levine is doing in this show, other than cashing a paycheck, but it is nice to see him getting some work. Ruta Gedmintas and Alana De La Garza aren’t particularly good as the possible love interests. They are both kind of vapid and wooden. I don’t really blame any of the actors, though; I think any actor would have a tough time selling any of this garbage. But these two women aren’t really helping matters. The show also tries to make room for some medical cases, but they are so forgettable that all they do is serve as a respite from the rest of this foolishness. They aren’t even that original; after you’ve watched a few seasons of Grey’s Anatomy or House, you expect a little more creativity. A woman who is abused by her police officer husband is about as trite as it comes. They obviously tried to give a nod to the source material with the name of the main character: Dr. Jason Cole = Dr. J Cole =Dr. Jekyll. They even make sure to linger on the placard on his door in case you don’t make the connection. Sometimes crazy in a show is good (see American Horror Story), but Do No Harm is not the good kind of crazy. I’m pretty sure the whole diabetes explanation that they give is totally made up. The networks really seem to want to make some variation of a show about multiple lives work; Fox tried it with the critically adored and soon canceled Lone Star and NBC has been down this road with their one season and done Awake. I just don’t know if this is a story that can be sustained over 22 episodes, even when it is done well. This cracked me up: on the IMBD page for Do No Harm, the first listed actor, which is usually the highest billed performer, is the stand-in for the Dr. Solaris character. A stand-in. That’s a clear sign that there is trouble. Believe it or not, this is actually the second pilot that they filmed for this series. After the first pilot, they made changes to address what they say were some of the problems with the show and from the critics I follow, this second pilot is a lot better than their first version. Now I am dying to see the original, because if this hunk of poo is the improvement I am really curious how this show was first conceived. I don’t see this show doing very well and I predict it will be canceled pretty quickly. I hope that Steven Pasquale, Phlylicia Rashad and Samm Levine have much success in their next projects, but if their agents talked them into Do No Harm, they may want to find some new representation. Do No Harm debuts tonight (Thursday January 31) at 10 pm (ET) on NBC (who else?). Lawless has all the ingredients to be a pretty entertaining movie by my standards: a bunch of actors I like, based on a true story, gangsters and violence. However, it failed to hold my attention throughout the movie; a meandering story and some too over the top characters failed to fully engage me. There are some solid performances here, but mayhem can’t cover up the flaws in the plotting. Lawless commits the biggest sin of them all: it was boring. Set in the 1930s, Lawless tells the tale of three bootlegging brothers in Franklin County Virginia: Forrest (Tom Hardy), the stoic leader of the group; Howard (Jason Clarke), the enforcer; and Jack (Shia LaBeouf), the runt of the group who serves primarily as their driver, but wants to do more. When Special Deputy Charley Rakes (Guy Pearce) rolls into town demanding a cut of the profits from all the bootleggers in the county, the Bondurant brothers are the only ones to refuse to give in to the intimidation. Thus begins a war between the brothers and the Special Deputy, which results in a lot of bloodshed. I’m the not the world’s biggest Shia LaBeouf fan, but he’s pretty solid as Jack. He’s given the most to do in this film, as the youngest brother tries to find his role in the family enterprise and tries to become a player in the bootlegging game, rather than a spectator. 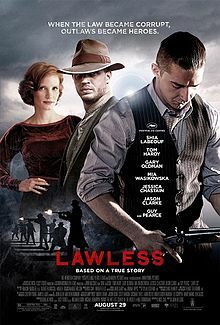 Lawless is really Jack’s journey, which is not all that surprising as the book that the film is based on (The Wettest County in the World) is written by the real Jack Bondurant’s grandson. Tom Hardy has the less showy performance and I don’t know if Forrest is a really supposed to be an emotionless guy or that’s just Hardy, but it quietly works for the most part. Jason Clarke is underutilized as Howard, the least fleshed out of the brothers. Clarke could have done a lot more if permitted. The main issue with the film is that it doesn’t know how to get out of its own way. The central premise outlined above is enough to make an interesting film about, but whatever momentum that story has is repeatedly squashed by needless detours into less interesting subplots. Two of these subplots involve actresses that I like a lot (Jessica Chastain and Mia Wasikowska); however, these stories are not all that developed and feel shoehorned into the rest of the movie. Perhaps they felt that there had to be some women in the film, but unfortunately these subplots serve more as a distraction more than anything else. The actresses did a good job, but their roles were unnecessary as written. I also thought that Guy Pearce’s Special Deputy was so one note and over the top that is was just too much. You can be a charismatic bad guy – see Heath Ledger as The Joker – but there has to be balance and some subtlety. Special Agent Rakes was a bit of a straw man bad guy; he was a bunch of stereotypes and broad personality traits without a lot of substance. I didn’t need his entire back story, but a little more restraint in the performance or characterization would have been preferred. Perhaps Pearce was simply trying to liven up these proceedings; at least when he was on screen, things were interesting. It may have been a little cartoony, but I did pay more attention when he was in a scene. The Dark Knight Rises has kind of ruined Tom Hardy for me; now every time I see him in anything, I expect to hear that weird Bane voice coming out of his mouth. Actually, the Bane voice might have livened things up. I found Hardy mumbled a lot in Lawless. For whatever other failings that Lawless has, the cinematography is beautiful. It’s a nice film to look at and I like the clothing from that time period. Not enough men wear hats anymore (other than ball caps). Fun facts: James Franco and Ryan Gosling were originally attached to play Howard and Forrest, respectively. I love both actors, but that would have been very different takes on the characters. However, we know from Gangster Squad that Gosling would have looked fabulous in the clothing. I’ve read a lot made of the violence of the film, which I didn’t think was really all that exaggerated. Maybe that says more about me and the movies I typically watched; your sensibilities may vary. The movie poster is trying to cash in on Jessica Chastain’s recent rise to stardom; her character is a supporting character and mostly in the background. The odd choice of pacing and the constant diversions into less compelling subplots holds Lawless back and makes it an uneven movie. The actors do what they can, but ultimately this is a movie that has what could be an exciting premise that it ultimately refuses to take advantage of . The result is a film that never really takes off; there are sporadic moments of excitement, but Lawless is dull overall. If there is one thing in the world that comes close to my love of pop culture, it is my love of ice cream (what – did you think I was going to say family?). If I didn’t have some semblance of trying to take care of myself, I could eat ice cream absolutely every single day. As far as I’m concerned, it’s the perfect food – creamy, delicious and pretty much devoid of nutritional content. I am, after all, the girl who was watching Twitter to see where the new Cannoli ice cream could be found. I’ve been blessed with a cat that loves ice cream as much as I do, though I try not to let him have it (if you’ve met Pumpkin, you can imagine how successful that is). 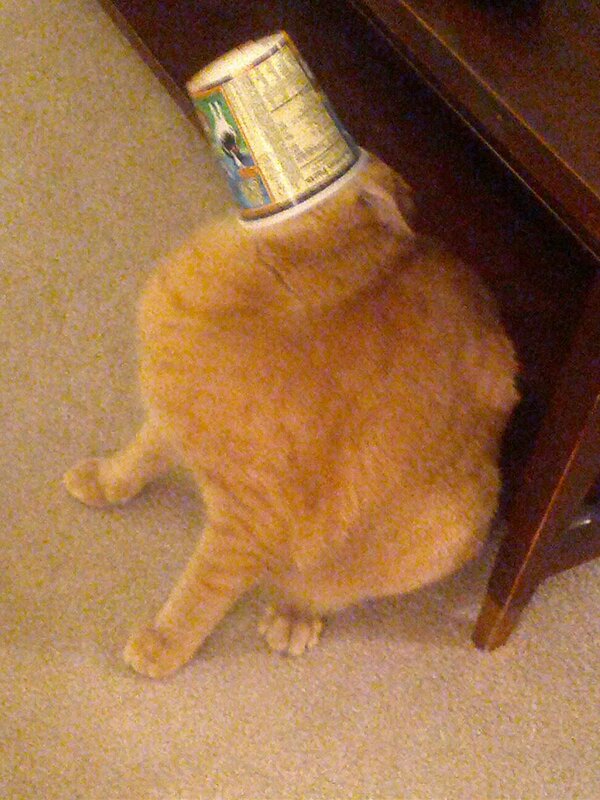 The fool even got his head stuck in an empty pint container when he was trying to be sneaky. I’m particularly partial to the ice cream stylings of Ben and Jerry’s. They have such fun and interesting flavors and I also am a fan of their corporate philosophy. I actually used to use Ben and Jerry’s as an example during my lecture on political economy back in my professorial days. I remember the first time my mom took me into the Ben and Jerry’s shop in Saratoga when I was a kid and I was just so overwhelmed by all the options that I asked for vanilla. Vanilla! All those amazing flavors and taste combinations and I picked the most boring of them all. Even chocolate would have been a better choice. It was good, of course, but far too conservative. As I’ve gotten older and I’ve become more adventurous with my palate and have branched out to the many diverse offerings that Ben and Jerry’s has. My all-time favorite is still Chubby Hubby (Fudge Covered Peanut Butter Filled Pretzels in Vanilla Malt Ice Cream Rippled with Fudge & Peanut Butter), though I will mix it up with Cake Batter (Yellow Cake Batter Ice Cream with a Chocolate Frosting Swirl), Half Baked (Chocolate & Vanilla Ice Creams with Fudge Brownies & Gobs of Chocolate Chip Cookie Dough) and What a Cluster (Peanut Butter Ice Cream with Caramel Cluster Pieces, Marshmallow Swirls & Peanut Buttery Swirls), though I preferred the latter when it was called Clusterfluff. And you should see how excited I get when I stumble upon the seasonal Pumpkin Cheesecake flavor; since you never know where it will show up and when it will disappear, I’ve been known to buy up whatever is in stock. Fan of the sketch – not a fan of the ice cream. I couldn’t even finish the pint, which is saying a lot. Unsurprisingly, my favorite of the celebrity flavors is Late Night Snack (Vanilla Bean Ice Cream with a Salty Caramel Swirl and Fudge Covered Potato Chip Clusters), inspired by Late Night with Jimmy Fallon. I’m a big fan of salty and sweet – see my love of Chubby Hubby – and there really isn’t anything better than chocolate covered potato chips. They promote the ice cream a lot during the show; many of the games that Jimmy plays with audience members involve Late Night Snack being dumped on a person or them sliding into it. I hate those games, as it is a waste of that tremendous ice cream. Last night the Ben and Jerry’s Tumblr had a special announcement: a new celebrity flavor was going to be unveiled on Thursday. Dots-Com – something with dipping dots to honor my favorite member of Tracy’s entourage? Something for Dennis Duffy, Liz’s reoccurring ex-boyfriend (played by the awesome Dean Winters)? Something with Blerg in the title? Something to do with Dr. Spaceman? Please? UPDATE: The Grub Street section on the New York Magazine website points out that in an episode of 30 Rock Tracy Jordan created his own Ben and Jerry’s flavor called Adultaraisin. I’m glad that there are people cleverer than me working on this because I don’t know that any of these sound particularly tasty or are all that funny. The show has so many great characters and memorable jokes that they have a lot to work with. As for the ice cream, I just hope there is some fun stuff in it like caramel, peanut butter, some kind of dough or marshmallow in it. I really can’t wait to see what they come up with. 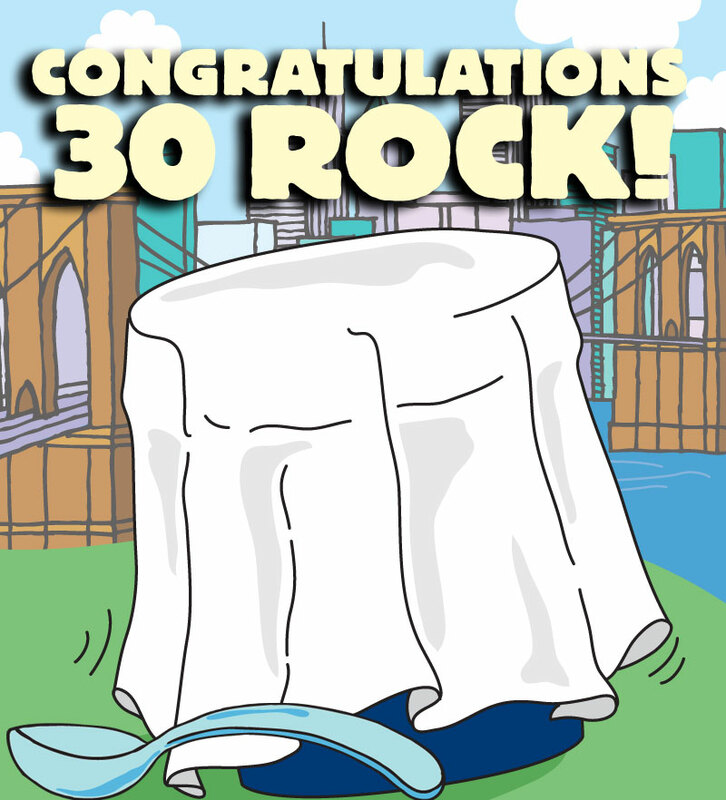 Got a clever idea for a 30 Rock inspired ice cream? Sound off in the comments below.